I have fellow blogger Linda Prospero to thank for this delicious dinner. Her blog, Ciao Chow LInda, is a work of art, both visual and culinary. 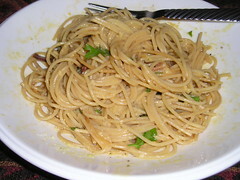 Her elemental recipe (from The Geometry of Pasta) for spaghetti alla carbonara gave me my best version ever, not just because it was pared down to the correct, limited, ingredients (pancetta, egg, cheese), but for the carefully spelled out procedure, too. For once, my eggs didn’t scramble themselves; instead I got just the creamy sauce I wanted. Grazie Linda!